By 1967, the original hippies were already raising their kids in the Haight. Here’s documentary proof. 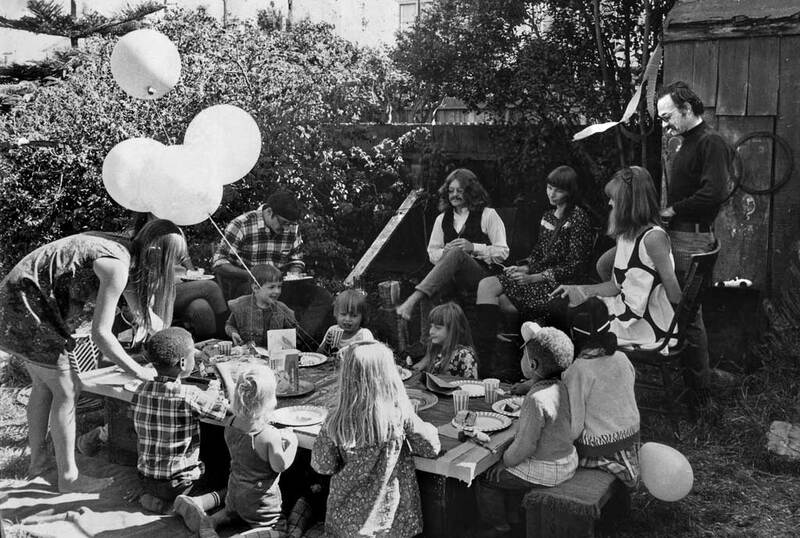 While the Summer of Love was going bonkers on Haight Street, two blocks away Bill and Barbara Laird were cutting cake and dishing out cherry vanilla ice cream for their four year old’s birthday bash. That’s the Pondering Pig wondering what’s become of his shoes while his erstwhile wife Linda Lovely decides whether to stick him with her fork. The blondie in the flowered dress with her back to the camera is our daughter Jenny – already four years old. This entry was posted in 1964-1969. The Haight-Ashbury And After and tagged birthdays, haight-ashbury by ponderpig. Bookmark the permalink. More family pictures please. I’m assembling a small collection of photos from this time period to send you, accompanied by a rather long letter, which is currently being edited. That is a GREAT picture. I love it. And, I’ll take some cherry vanilla ice cream, if you please. Elijah would like to have one of the balloons. Great photo! Really takes me back. While you were having cake and ice cream, I was in the fifth grade at nearby Twin Peaks Elementary School. Much of the hills were still undeveloped up there. I started wearing glasses that year, and I had yet to develop my first crush on Suzie McEvers. I was obsessed with Peanuts, and Snoopy’s presidential aspirations were just beginning, as were Pat Paulsen’s. It was a great time. Man, I love birthday parties and this one looks like my aunt Friskie’s pajamas. Hippies and kids dropping food on the ground for me. Paradise, Pig. Paradise. Hey. I was there. If you look really close above Linda’s head, you can see my huntin’ and gatherin’ technique. Well, mybe better you don’t see it. That’s my survival edge. The cake crumbs was good and the ice cream drips were tasty. I was wishing for some of those haycorns, but didn’t nobody drop none. I overheard the Pig talking about some plot to strog-arm the SF Chronicle and maybe start an alternative press. He wanted to call it “Smokestack Lightning”. I knew he was on to something, but times being as they were, some weiner named Wenner started some “Rolling Stone” screed nonsense. Personally, I think “Smokestack Lightning” would have been much more exciting and, while not profitable, a great expression of the scene. Well, howdy there, Trickersquirrel. Always nice to have another talking animal drop by the blog. There were only 46 of us, but now you make 47. When we get to fifty, we’ll be just like the good ole USA, so we’re all going to take state’s names for nicknames. I’m thinking about calling you Arizony. Is that okay? Kind of like that old time movie actor Gabby Hayes. He always played funny sidekicks with names like Arizony or New Mexiky. As I remember, nobody ever thought of Smokestack Lightning as a magazine name before, although there used to be tons of young ladies in the Haight who played it on bottleneck guitar while drinking T-Bird from an ole fruit jar. I always thought The Electric Prunes did the best version, didn’t you? The first rock magazine in the Haight was called The Mojo Navigator and copies of it today are worth a pretty penny. Once they did a whole issue on the lady bottleneck players of Haight Street. Thanks for dropping by, and come again! “Arizony” is okie-dokie. I’d prefer something more dangerous like “Six-Gun Sid” or “Rock ‘n’ Rodent” , but “Arizony” will be just fine. Maybe I can keep under the radar and avoid undue publicity. After all, I’ve been everywhere, man. But, no, Pigg. The definitive “Smokestack Lightnin'” is and always be the original Chester Arthur Burnett from 1956. The Prunes version was hot and I kinda liked the upstart Soundgarden arrangement. But nothing compares to the “Wolf”. Pigpen don’t even come close, and I loved Pigpen. Off I go. In the words of Gov. Arnold, “I’ll be back”. Well, you might be right, squirrel. But I don’t remember any of those T-Bird bottleneck ladies on Haight Street ever talking about Lightin’ Hopkins or whoever it was after the Electric Prune’s version came out. It was nothing but Prunes, Prunes, Prunes. Why, I happened to be backstage at the Avalon the night Howlin’ Wolf first heard their version. Somebody had bought a 45 of it at Woolworth’s. He said he was going to have to get off his Cole Porter kick and go back to his Chicago roots if he was going to keep up with these Prune kids. That’s after he released Howlin’ Wolf Sings Cole Porter. You probably remember it. It tanked. Hi. Love your pic! Who were the Hippies in 1965? I need to ask someone this. I asked this question of the air when I started to compose a piece on the International Poetry Incarnation. The idea of the question is, in 65 when the beatniks of 5 or 10 years before were performing, who were these new people who were in the seats at this (I’ve heard called) “first-ever Happening”. Is any of this accurate? Who were the Hippies in 65? Who were these people in the seats of the old beatnik poetry show? What was there at the time? Hipsters–beats? Jazz? Folk? I think you’re going to enjoy my book, which is due out in a matter of weeks and is about exactly that question. It’s called The First Few Friends I Had — I’ll be posting about it. I’m waiting for the printed review copy to arrive to check for typos and stuff, then…out the door and into the world for your pleasure and delectation.